Our Super Bowl History pages end with Super Bowl XLII, the latest and (perhaps) most dramatic Super Bowl of them all. This game pitted the 18-0 New England Patriots against the 6th seed of the NFC playoffs, the New York Giants. The Giants knocked off the unbeaten and seemingly unbeatable Patriots, which were making a push to win their 4th Super Bowl in 7 years. Instead, the Giants won their 3 Super Bowl title in franchise history. As the years continue, we’ll continue to add pages for each new Super Bowl. I hope everyone has enjoyed reading this recap of the history of the Superbowls. The latest Super Bowl team is one of the best stories in Superbowl History. It pitted a classic underdog versus the seemingly unbeatable favorite which was playing for history. Certainly, it didn’t hurt that the two teams involved were from Boston and New York, two of the great media markets in America. The New England Patriots started the season on a mission. For two seasons, the Pats had been one of the Super Bowl favorites. Coming off a stretch of three Super Bowl titles in four seasons, with Tom Brady at quarterback and one of the league’s best defenses, there was a lot to like. But the team lost a 2nd round AFC division match to the Broncos in the 2005-2006 season when Brady threw a 100+ yard touchdown interception to Champ Bailey of the Denver Broncos, while the team collapsed in the final minutes of the AFC Championship Game the previous season. One reason given for these losses was the Patriots’ sub-par receiving corps. They decided to change their receivers in the offseason. They started with a trade for Randy Moss, who was coming off of two disappointing, injury-riddled seasons with the Oakland Raiders (and a third, similar season with the Minnesota Vikings just prior to his Raiders stint). 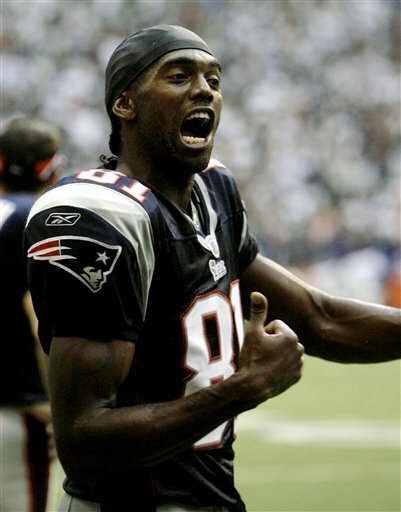 The Patriots received Moss for a 4th round pick, for a receiver who a few short seasons before had been one of the league’s most dangerous receiving threats. To follow this up, the New England Patriots signed Donte Stallworth and Wes Welker to free agent contracts. Stallworth was another big play threat, whose promising career with the New Orleans Saints and Philadelphia Eagles had been marred by injuries. Wes Welker was a third receiver for the Miami Dolphins, a player whom Pats’ coach Bill Belichik wanted because Welker always seemed to hurt the Patriots. This receiving corps upgrade fueled (arguably) the best regular season in NFL History, and the only regular season which ended with a 16-0 record. (The 1972 Miami Dolphins were unbeaten, but they finished with a 14-0 record.) Tom Brady set the single-season passing touchdown record, while Randy Moss set the single-season receiving touchdown record. Their margins of victory were remarkable, none the less because of the scandal that marred their otherwise perfect regular season. This was the Spygate Scandal, which took place the week after Week 1 of the NFL Season. In their first game of the season, the New England Patriots played the New York Jets at the Meadowlands. After the game, a Patriots blowout, the Jets sent evidence to the league office that the Patriots had taped Jets’ defensive signals’ during the game. New York Jets head coach Eric Mangini, a former Patriots assistant under Bill Belichick, recognized the man the Patriots used to tape signals. 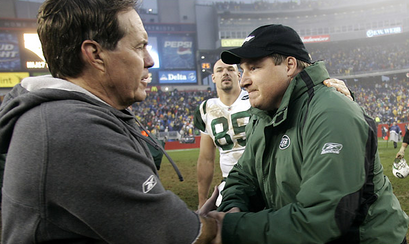 Mangini and Belichik also were developing a rivalry, following a Jets regular season win the previous year and the Patriots subsequent defeat of the Jets in a later playoff game. NFL Commissioner Roger Goodell was displeased by this turn of events. Though NFL teams had taped one another’s signals for years, Goodell had sent an offseason memo to NFL teams warning them to quit the practice. So when the New England Patriots were caught taping games, Goodell moved to punish them. Bill Belichik was fined $500,000 and the Patriots had their 1st round pick taken from them in the next NFL Draft. This hardly stopped the controversy. Some believed Goodell had gone too lightly on the Patriots, and that he hoped to sweep the scandal under rug quickly, before it overshadowed the new NFL season. Others believed that Bill Belichick had been humiliated by Goodell’s fine, and the Patriots went on a mission to demolish their NFL opponents. Under these circumstances, the Patriots’ huge point totals were weighed by the sports media and NFL fans. Nevertheless, the New England Patriots went unbeaten through 16 regular season games, as well as 2 AFC playoff games. They entered the Super Bowl as a heavy favorite, seeking to become the first team to go 19-0 and putting an exclamation point on their position as team of the decade by winning their 4th Super Bowl in 7 years. The New York Giants, on the other hand, came into the big game as a feel-good story. It hardly seemed like a feel-good team in the preseason. Michael Strahan, the Hall of Fame defensive end, sat out the preseason and threatened to retire. Tiki Barber, a star on Giants teams for 10 years, retired in the offseason, criticizing Eli Manning and hinting that he might have remained, if the team had fired head coach Tom Coughlin. 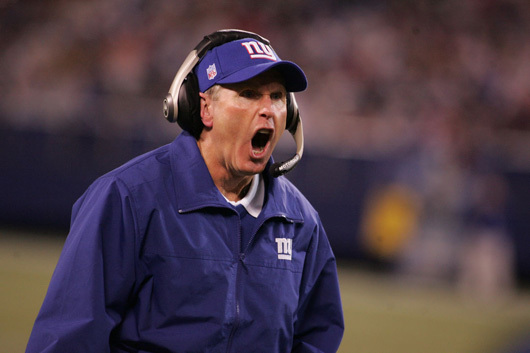 Tom Coughlin was hardly a fan favorite coming into the season. Coughlin had been an assistant for Bill Parcells during his time with the Giants. Coughlin had taken the Jacksonville Jaguars expansion franchise to two AFC Championship games, but was heavily criticized in his later years there, even having a public falling out with star quarterback, Mark Brunell. Coughlin had come over to the New York Giants as a hard-edged coach who was expected to get into line an unruly locker room. The New York Giants cast of characters was thought to have gone too far under Jim Fassell, the previous Giants coach. With personalities like Strahan, Barber, Plaxico Burress and Jeremy Shockey, it was thought the Giants needed a firm hand. This firm hand ruffled many feathers among longtime Giants stars, and there was heavy criticism from players in the New York City media. After a pair of 1st round playoff exits (losses at the Meadowlands), the New York media began to call for Coughlin’s head. With this as a backdrop, Coughlin was beginning to change his tactics. In an attempt to change the locker room chemistry, he began to consult with veteran players. Strahan returned to the team just prior to the start of the season, so it appeared it might take awhile to round the team into shape. In the first game of the season, the New York Giants lost to the Dallas Cowboys in a big Sunday night game. The Giants lost Osi Umenyiora and Brandon Jacobs (Tiki’s replacement) to injuries in that game, and Eli Manning was also injured. The next week brought another division loss, this time to the Green Bay Packers. The Cowboys loss was disappointing, but the Packers loss was an outrage, because the Giants were thought to be a much better team. Little did anyone known that the Cowboys and Packers would end with the NFC’s two best records, and the Giants’ losses would appear less disastrous in retrospect. Whatever the case, it was speculated that Coughlin would lose his job with a loss in Week 3 to a 2nd division rival, the Washington Redskins. The Giants were losing at halftime, but they rallied to pull to a 1-2 record. This would touch off a 6-game winning streak, including a win over the Miami Dolphins in Wembley Stadium in London, the first regular season NFL game in a foreign country. The winning streak came to an end with a second loss to the Dallas Cowboys. This began a streak for the remainder of the regular season, where the Giants seemed to trade a win with a loss. The team ended with a 10-6 regular season record and the 6th seed in the NFC. Ironically, one of these losses was considered the turning point of the season. In the 16th and final game of the season, the New York Giants faced the New England Patriots. The Giants had sown up the 6th seed in the playoffs, while the Patriots (themselves with the #1 seed in the AFC) were playing for their much-coveted 16-0 record. Instead of sitting his starters, Tom Coughlin chose to play a real game against the New England Patriots, after heeding the wishes of his team leaders. The Giants wanted to match themselves against the league’s best team, and they took a 21-16 lead at halftime. Eventually, the New England Patriots came back to win the game 38-35, but the Giants saw that they could battle even the best NFL teams play-for-play. They would take this confidence with them on the road in the playoffs. After giving the Tampa Bay Buccaneers a 7-0 lead in the first quarter of their NFC Wildcard matchup, they Giants began to take control of the game with two touchdowns in the second quarter. The Giants win over the Bucs set up a third showdown with the Dallas Cowboys, who had beaten the Giants twice that season. The Giants struck first in the second round playoff game, much as they had in the season-opener against the Dallas Cowboys. The Cowboys came back with two long touchdown drives. Though the first half ended 14-14, the Dallas Cowboys had controlled the clock, and appeared to be wearing down the Giants defense. In the third quarter, there was only one score: a Dallas field goal. But when Eli Manning led the Giants on a 4th quarter touchdown drive, suddenly the Giants looked as if they might pull off the upset. Their defense, which had stifled the Cowboys throughout the second half, began to show the brilliance which would take them through the postseason. The Giants pass rush, led by Osi Umenyiora, Justin Tuck and Michael Strahan, began to harry Tony Romo. Though Romo led the Cowboys on a late drive, this drive came up short, with a final heave into the endzone from the Giants 22-yard line. Next up were the Green Bay Packers at Lambeau Field. The Packers were 13-3 in the regular season, and were being led by Brett Favre in his final NFL season. Green Bay Packers had an underrated defense led by big cornerbacks and a strong pass rush, while their running game was bolstered by Ryan Grant, himself a New York Giant the previous season. The Giants and Packers played a defensive struggle in the cold of Green Bay, eventually playing into sudden death overtime. New York Giants kicker, Lawrence Tynes, missed two 4th quarter field goals, and this looked like it would be the story of the end of the Giants season. Instead, Brett Favre threw an interception on the first drive in overtime. 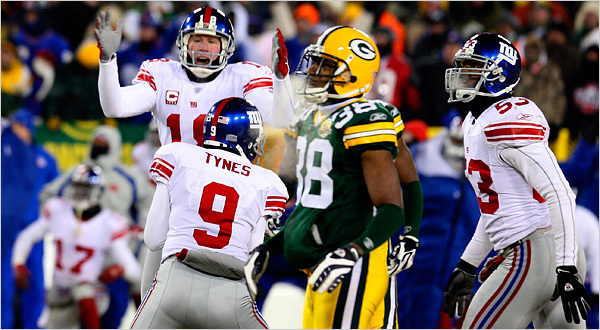 After a short drive, Lawrence Tynes kicked a game-winning field goal, sending the underdog Giants to the Super Bowl. In the week prior to the Super Bowl, Plaxico Burress predicted a Giants victory by a 21-17 margin. Patriots quarterback Tom Brady, coming off a record-setting offensive year, quipped that he wasn’t upset by the prediction — just that Plaxico assumed the Patriots would only score 17 points. Plaxico actually underestimated his team’s defense, because it held the powerful Patriots to 14. That was the story of the New York Giants Superbowl victory. Their defensive pass rush was the best that Tom Brady would see all season, and the Giants pass rushers would overwhelm the Patriots offensive line all day. Despite a supposedly weak defensive backfield, the Giants were able to shut down Randy Moss and Wes Welker, two of the most productive NFL receivers all year. Meanwhile, Eli Manning finally proved his critics wrong. Ever since his draft day trade from the San Diego Chargers (Eli’s people demanded a trade from the Chargers, and presumably handpicked the Giants), he had lived in the shadow of his brother, Peyton. This was even more pronounced since the previous Super Bowl, when Peyton Manning was Super Bowl MVP. Now, Eli would be forced to lead his team on a 4th quarter comeback against the New England Patriots, who had a reputation for always coming through in the clutch. Though Eli was having only a so-so day, he was able to pull off this supposed miracle. In a signature moment, Eli Manning evaded a sack (from a Patriots defender who had a handful of Eli’s jersey) and heaved the ball down the field on a key third down conversion to David Tyree, who caught a long 32-yard pass. Eli Manning would throw the game-winning touchdown to Plaxico Burress a few minutes later (Eli had earlier thrown a touchdown to Tyree). This left the New England Patriots barely over 30 seconds to engineer a comeback drive. This drive came to nothing and the New York Giants were the new world champions. While others might argue for the New York Jets over the Baltimore Colts in Super Bowl III, it can be argued with a large degree of merit that the Giants victory in Super Bowl XLII is the biggest upset in Super Bowl History.